Virtually all ancient calendars were initially based on a 360-day year: 12 months of 30 days each. However, all calendars change in 701 b.c. ; they all resort to adjustments to accommodate the current sidereal reckoning. Why? The sun retreats ten degrees on the sundial of Ahaz (Isaiah 38:7–8). Isaiah was the official prophet that served King Hezekiah. In general, Hezekiah did well: he tore down the idols throughout the land and reestablished worship to the true living God in Jerusalem. However, this was misunderstood by his enemies. The Assyrians were encamped against Jerusalem, encouraged by their soothsayers and astrologers. Hezekiah’s anxiety came from the imminent attack of the Assyrians, led by Sennacherib. The fears associated with the awesome power of the Assyrian Empire were justified: they were very powerful and relished in extreme brutalities upon their captives. However, Isaiah counseled Hezekiah that God was going to intervene and protect them. And He certainly did. On the Passover night of March 20, 701 b.c., the angel dramatically destroyed 185,000 (of an estimated 250,000) Assyrians.1 It is provocative—and perhaps quite insightful—that so many catastrophic events frequently occurred on the precise anniversary of the Passover of Egypt. This is suggestive of a cyclical (perhaps orbital) mechanism being employed. Could these events also bear a relationship to the drama that occurred on the fabled “long day” of Joshua? The subsequent behavior regarding Ahaz’s sundial is also suggestive of some “cosmological irregularities.” Could they all be related to orbital planetary intervention? Could an interplanetary flux tube have been an instrument of God’s intervention on behalf of Jerusalem? Could Sennacherib’s extensive iron weapons and chariots present been a distinguishing (electromagnetic) factor highlighting the vulnerability of the Assyrian warriors? Apparently, Sennacherib personally also suffered some strange burns, although his clothes were unscathed.3 This, too, is suggestive. The Long Day of Joshua apparently occurred on 1080th anniversary of the Flood of Noah, and the 540th anniversary of the Tower Babel event. The confrontation on Mount Carmel would occur on the 540th anniversary of the Long Day of Joshua. A careful study of the cyclic underpinnings, and the frequent multiples of 54 (or 108) years, supports the view involving orbital resonances with the planet Mars (with assists involving Jupiter and Saturn as well). 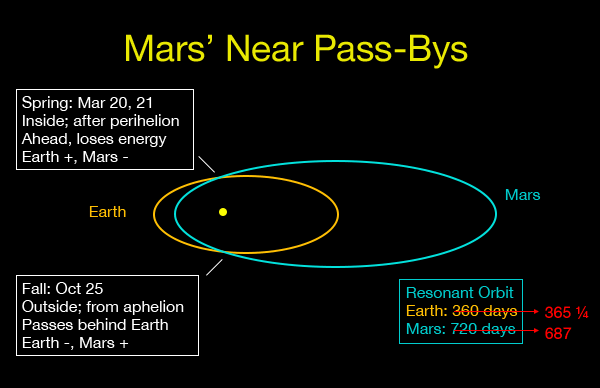 The apparent role of the near pass-bys of the planet Mars is persuasive. The Mars near pass-by in 701 b.c. was particularly distinctive in that, for orbital mechanics reasons, it stabilized both the Earth and Mars in their present non-resonant orbits, ending the disruptive pass-bys. The Roche limit is the distance within which a celestial body, held together only by its own gravity, will disintegrate due to a second celestial body’s tidal forces exceeding the first body’s gravitational self-attraction. Inside the Roche limit, orbiting material will tend to disperse and form rings, while outside the limit, material will tend to coalesce. It is suspected that it was the penetration of a Roche limit that led to the fragmentation resulting in the numerous asteroids now infiltrating the solar system, forming the rings around Saturn, and pockmarking the planet Mars. Yet, why are over 90% of the craters on Mars located in a single hemisphere? It would appear that the majority of them occurred in a single epoch of time. It has been suspected that if the fragments were composed of ice—a source of water—they could also account for the peculiar erosion evidences on Mars, and despite the current absence of water, perhaps they could have been an additional factor in the flood of Noah. We are all victims of a form of uniformitarianism, a presumption that ignores observable evidences, and desperately requires reexamination. Even a casual review of the solar system reveals that it was once a very rough neighborhood. And its history is surprisingly well documented in ancient records. The diligent student will discover that behind the Biblical records lie surprises illuminating the realities of both the macrocosm and the microcosm of cosmological history, a drama indelibly written on the tapestry of what apparently is a holographic universe.7 We are having a grand time with our continuing current study of Isaiah. Come join us on www.KITrust.org. There are even bigger surprises in the chapters ahead. January 2013 Personal Update NewsJournal. Donald Patten, Ronald Hatch, and Loren Steinhauer, The Long Day of Joshua , Pacific Meridian Publishing Company, Seattle, Washington, 1973. Donald Patten, Catastrophism and the Old Testament , Pacific Meridian Publishing Company Seattle, WA 1988; Also, Patten, Donald, W., and Windsor, Samuel R., Recent Organization of the Solar System , Pacific Meridian Publishing Company, Seattle, Washington, 1995. LouisGinzberg, Legends of the Jews , Jewish Publication Society of America, 2nd Edition, 1938; Vol 2, p.1047, note 59. Ancient calendars featuring 360-day years include Arabia, Assyria, Babylonia, China, Egypt, Greece, Hebrews, India, Japan, Mexico, Persia, Peru. This strange corroboration is discussed in our Expositional Commentary on Joshua , and also in our summary survey, Learn the Bible in 24 Hours . The two moons are very small, and have an albedo (reflectivity) of less than 3% (almost black). The further observation is that one of them, Phobos, is the only moon in the solar system going backwards! Read our materials on the “boundaries of our physical reality” to better appreciate and understand the Bible.